At this point in late September, we’re starting to reach that point of using what things are still coming in from the garden along with the things we can find in our freezer and pantry to make new dishes. 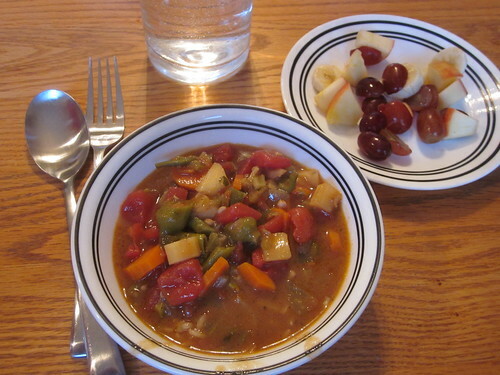 We’re also starting to move into more “fall”-type dishes, such as heartier soups and stews. Our vegetarian gumbo is a great example of all of these things at once. 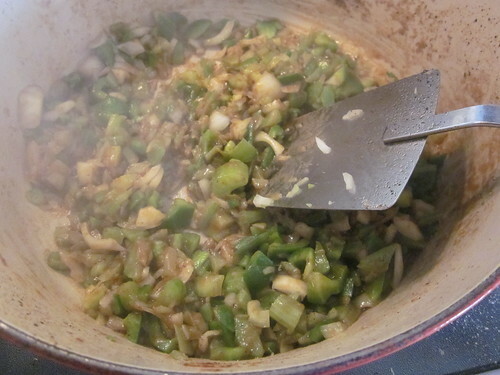 You’ll need a half a cup of flour and a half a cup of your preferred vegetable oil to make the roux, a key flavorful part of the gumbo. You’ll also need a variety of vegetables – we used a small onion, a small bell pepper, a stalk of celery, a diced tomato, a handful of green beans, two sliced carrots, a handful of sliced okra, and a bit of cumin, paprika, and oregano for spicing. This will all be served over rice, so you’ll also need that. 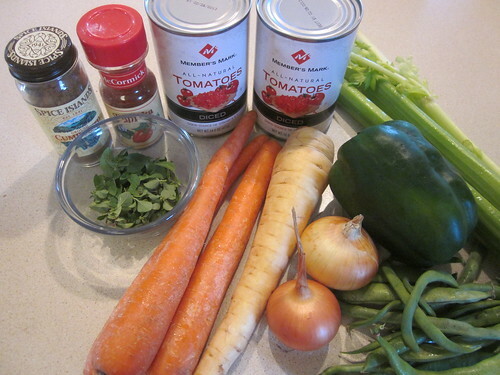 The biggest preparatory step you can take is to simply chop up all of your vegetables in advance. This is a great prep step that you can always do the evening before or the morning before a meal prep. The first step is to get your rice cooking so that it’s ready when the gumbo is finished. Rice is quite simple to prepare, so I won’t focus on the details of that here. The next step is to make the roux, which is essentially just a mix of flour and fat. Since we’re making a vegetarian gumbo, your fat will come in the form of a vegetable oil. 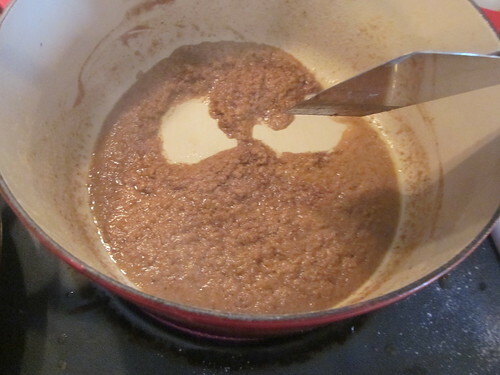 Simply stir together the flour and oil over medium-high heat for about ten minutes, constantly stirring, until it begins to turn a bit of a caramel color, something like this (I perhaps added a bit too much flour to the roux here, but it’s workable). As soon as you have roux, add the stiffer vegetables (like the onion, bell pepper, and celery) and cook for another five minutes, stirring a lot at the start to distribute the roux, then regularly thereafter. At this point, add all of the remaining ingredients and about four cups of water. Stir thouroughly and then let it simmer for about forty minutes, stirring regularly. When everything’s finished and the vegetables are tender (the carrots are probably the best ones to check), simply put some rice in a bowl or on a plate and pour some of the gumbo on top. Delicious! We served it with a fruit medley. 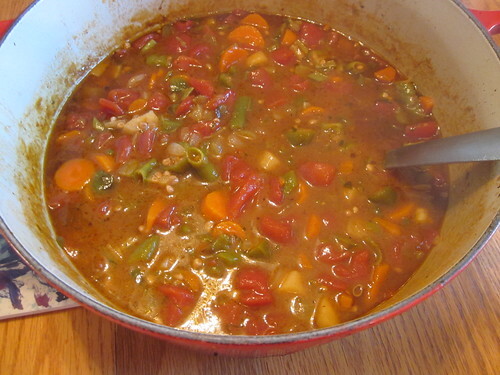 You can get away with using pretty much any vegetable in gumbo, though I would consider tomatoes and onions to be pretty essential, and okra to be nearly so. Simply use up whatever your garden is providing or whatever vegetables you can easily acquire. If you wish to add meat, you can easily add sausage and chicken to this meal. Cook the sausage and chicken in the pan before you do anything else. Remove the meat and leave the fats behind, using them as the “fat” portion of the roux that you make by simply adding flour to the liquid in the pan after you remove the meat and stirring it rapidly.